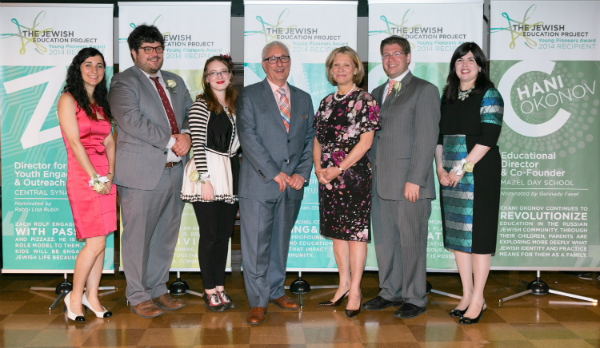 (New York, NY) At a Celebration event last week, 5 exceptional and highly innovative Jewish educators received The Jewish Education 2014 Young Pioneers Award. These remarkable young men and women are changing the face of Jewish education, by boldly trying new methods to engage kids and teens; by educating not just children but their parents and communities; by utilizing other disciplines to provide a more dynamic and creative Jewish learning experience; by reaching populations that are underserved, like Russian Jews and children with special needs; by looking at the individual skills, abilities and needs of every child and designing education that is right for them; and by showing children how Judaism matters to their lives. In recognition of their innovative approaches to Jewish education, Timna Burston, Art Educator at Congregation Kol Ami (White Plains, NY) and Beit Rabban Day School (Manhattan, NY); Stav Meishar, Founder of Dreamcoat Experience (NY); Menachem Menchel, Director of Youth Education and Programming at Hebrew Institute of Riverdale (Bronx, New York); Chani Okonov, Co-founder and Educational Director of Mazel Day School (Brooklyn, NY) & Zachary Rolf, Director for Youth Engagement and Outreach at Central Synagogue (Manhattan, NY), have each been selected to receive the 2014 Young Pioneers Award. Young Pioneers Recipients with CEO Robert Sherman and President of Board of Directors. Photo Credit: The Jewish Education Project. They were recognized at a Celebration to benefit The Jewish Education Project held at the New York Academy of Medicine on May 21st at 6:45 pm. 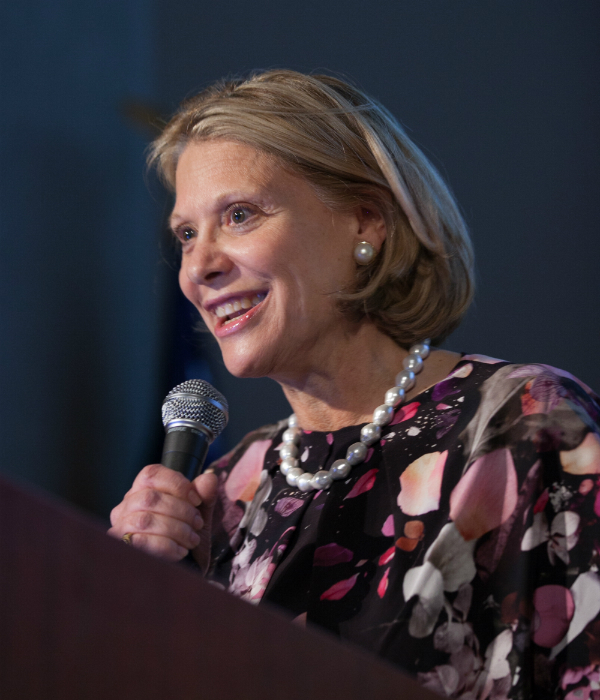 The Celebration also honored Dorothy Tananbaum, President of the Board of Directors of the agency and included remarks by John Ruskay, Executive Vice President and CEO of UJA-Federation of New York. The evening also included an interactive “mitzvah” juggling experience that demonstrated experiential Jewish education. Audience members juggling scarves in display of experiential Jewish education. Photo Credit: The Jewish Education Project. 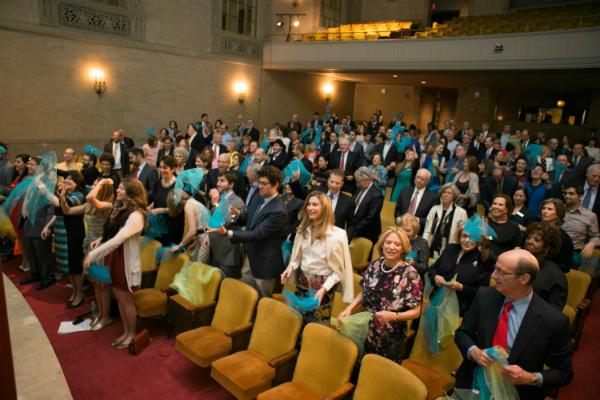 The award recipients receive a $360 Professional Development stipend, public recognition at the Celebration, and will tickets to the 5th Annual Jewish Futures “UnConference” titled “Visions of Jewish Life and Learning” hosted by The Jewish Education Project. “I’m thrilled and thankful to be recognized as an educator who promotes the values of creativity and playfulness in the fast-growing field of Experiential Jewish Education,” says Stav Meishar. Honoree and President of Board of Directors Dorothy Tananbaum. Photo Credit: The Jewish Education Project. To learn more about The Young Pioneers Awards or The Jewish Education Project’s other initiatives please visit JewishEdProject.org. The Jewish Education Project (formerly BJENY-SAJES) sparks and spreads innovations that expand the reach and increase the impact of Jewish education. Their work touches 200,000 children in 800 programs including Congregational Schools, Day Schools and Yeshivot, Early Childhood Centers, Family Engagement Programs and Teen Initiatives. From the Jewish Futures Conferences, the Day School Collaboration Network (DSCN), the Parent to Parent Network, the In-Site-Ful Journeys, the DigitalJLearning Network, and Operation: Game Changer to the Coalition of Innovating Congregations, they empower the next generation of Jews in Westchester, New York City and Long Island to live as actively engaged members of the Jewish community. The Jewish Education Project is a beneficiary agency of UJA-Federation of New York. Timna is an Art Educator who focuses on combining the arts with Jewish and Israeli culture in a variety of settings. Timna served as Youth Director and teacher at Congregation Kol Ami in Westchester, a member of The Jewish Education Project’s Coalition of Innovating Congregations. There, she created engaging programs for teens, often integrating her love of art. She designed a series of art classes exploring Jewish themes, from interpreting Bar/Bat Mitzvah portions to creating Jewish comics about heroes and monsters. She also led activities for adolescents in the greater community, including a social justice trip to Costa Rica, volunteer projects to feed the homeless, and lobbying trips to Washington, D.C. Timna has recently begun a new role at Kol Ami, reimagining the Hebrew curriculum for Kindergarten through third grade and creating an innovative Hebrew immersion program that utilizes the arts. Timna also teaches art at Beit Rabban Day School, a Jewish elementary school, where she has joined with Hebrew teachers to find bridges between the Hebrew language and the arts curriculum. In addition to her work with children, she co-founded Jewish Eyes on the Arts, a group devoted to exploring the Jewish ideas that can be found in arts and popular culture. Stav is the Founding Director of Dreamcoat Experience, an award-winning organization that brings experiential, creative educational programs for children to synagogues, Hebrew schools and Jewish communities throughout New York. As a performer and teaching artist born and raised in Israel, Stav specializes in weaving her artistic skills into her teaching methods, using circus, drama, music, dance, and yoga to teach Hebrew, Torah, Israeli culture, and Jewish values. Whether she teaches children about mitzvot using juggling or about Torah stories using human pyramids, she brings creativity to all elements of her teaching. Stav utilizes a child’s natural, playful spark to enhance their learning experience, while also helping them develop their imagination, motor skills, coordination, and collaboration. As part of this work, she has recently joined The Jewish Education Project’s Coalition of Family Engagement Innovators. When Stav is not teaching she proudly juggles (no pun intended!) a career in the performing arts as a stage and circus performer. Menachem is the Director of Youth Education and Programming at Hebrew Institute of Riverdale(HIR), designing and coordinating the youth programming for 800 families with creativity and enthusiasm. Menachem has made innovative changes to synagogue programming at multiple levels, including incorporating more technology, creating experiential programs that allow children to become comfortable in a synagogue setting, and empowering children and teens to take ownership of their synagogue experience. Menachem has the unique ability to create educational programs that cater to the needs and challenges of every age group within the synagogue. He has integrated children’s programs into the greater community, both within and beyond his institution, by involving parents, other synagogues, senior residences and non-profits. His innovative programs have led to higher attendance at social events and increased enthusiasm and participation at prayer services. Despite concerns that kids were too busy after school to attend synagogue programs, attendance has continued to increase under Menachem’s leadership. Menachem also successfully overhauled the teen program to give teens more autonomy, leadership training, and a greater sense of collegiality. Menachem’s ability to combine fun and learning has led to smartly-crafted, kid-friendly, and profound educational programs that have had an impact on the entire synagogue community. Chani is the Co-founder and Educational Director of Mazel Day School (MDS), a growing day school in South Brooklyn catering primarily to Russian-speaking Jewish families and their unique academic needs. Under Chani’s leadership, the school has grown from just three children in 2002, to 14 classes and over 170 students today. Known for its warm environment and child-centered approach, MDS also maintains high standards in professionalism, academic achievement and engaging learning experiences. As a member of The Jewish Education Project’s Day School Collaboration Network, Chani continues to be open to new ideas to strengthen her school. Chaniis a key participant in The Jewish Education Project’s Parent to Parent initiative and has successfully engaged the parent body to become partners with school leadership. Her work reaches beyond the students in MDS to their parents, extended family, and the greater Russian Jewish community. Zachary is changing the way teenagers engage with their Jewish community as a part of Central Synagogue, in the heart of Manhattan. As Director for Youth Engagement and Outreach for students in third to twelfth grade, Zach has led a transformation in the congregation’s youth programming culture. The crown jewel of the youth program has become the study trip curriculum that Zach has created, with both domestic and international travel opportunities beginning with eighth graders. In the last four years, over 250 Central Synagogue teens have had the opportunity to travel to local and international locations including New Orleans, Washington, D.C., Paris, Israel, Belarus, Prague, Amsterdam, and Berlin. Under Zach’s leadership, there have been major successes in post-b’nei mitzvah engagement. Central Synagogue’s confirmation class has grown from 12 students to almost 40, the largest they have seen since the 1960’s. Additionally, the multiple youth groups have provided opportunities for elementary students to engage Jewishly outside of the classroom. The common denominator for all of these accomplishments is the relationship formed between students and the congregation – with peers, educators, and clergy. Zach has created dynamic options for students at any age and has made the synagogue community relevant and important to children and teens.